Apple has posted an announcement on the outside of its Fifth Avenue store in New York, which is currently undergoing rennovation, that details some of its plans for the store’s new facade, reports MacRumors. 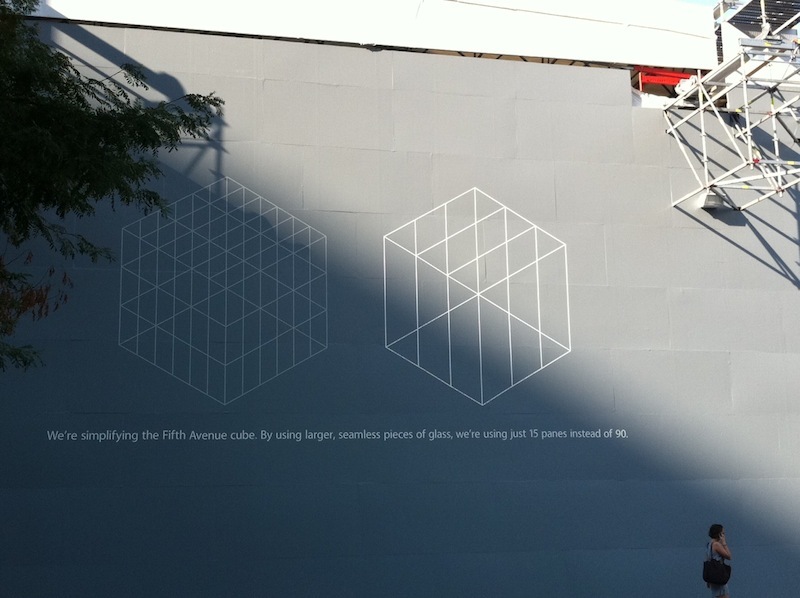 The notice indicates that Apple plans on replacing the 90 glass panels that previously made up the cube with just 15 seamless glass segments. The segments will be huge, with only 3, running from the top of the store to the bottom, on each side and 3 on top. The 5th Avenue Apple Store is one of the most iconic structures in the world and its cube shape has become one of the most photographed locations in NYC. We’re simplifying the Fifth Avenue cube. By using larger, seamless pieces of glass, we’re using just 15 panes instead of 90. The cube’s larger glass panes will most likely be made by Seele GbmH & Co., a German glass manufacturer that is Apple’s preferred partner as it is one of only two in the world that have been able to produce glass that stands up to the rigorous demands of Apple’s architects, like Bohlin Cywinski Jackson, who designed the 5th Ave. cube. The other company, Beijing-based North Glass Safety Glass Co., produced the panes for the equally impressive store in Shanghai, China. These panes are 41 ft long, 8 1/2 feet wide and they’re curved to boot. In comparison, the new panes being installed in the 5th Ave. store will be just over 32 feet long and roughly 10 feet wide. This should make the new version of Apple’s cube an even more impressive New York landmark, as is appropriate for one of the most heavily trafficked Apple Stores in the world. Read next: Boomerang for Gmail goes mobile. Send and receive email when you want, from anywhere.